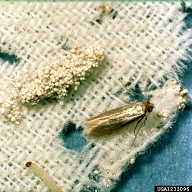 Life stages of the clothing moth: eggs, larvae and adult moth. From USDA Cooperative Extension Slide Series. Right around Halloween, we start packing away our light summer wear and unpacking our winter woolies. Occasionally that simple task turns into something out of a horror movie if your sweaters and tartans have been invaded by clothing moths. Clothing moths are determined little insects with an appetite for more than just wool. We’ve seen their telltale holes and webbing on almost any fiber that comes from an animal. And they don’t just fancy clothing—they’re equally happy in carpets, furniture, blankets and yarn. Like most stealth invaders, moths do their best work in the dark, meaning they’re likely to be found in attics, basements and closets. And it’s not the moths themselves that do the damage, it’s the larvae. You’re unlikely to find them on a coat you wear regularly or in the dining room oriental carpet. But a coat that’s been stored in a closet for a few years, or a rug that’s rolled and stored under the bed…that’s another story. Moth balls have been used for generations to repel clothing moths. An open box of moth balls in a closet won’t actually do any good. Moth balls work by slowly degrading into a toxic pesticide gas. If you’re not trapping that gas in small tightly sealed area, it’s probably not strong enough to actually kill moths. And do you really want to sleep in blankets or wear jackets that are steeped in toxic gas anyway? Cedar blocks certainly smell nicer than moth balls, but they’re also not terribly useful for repelling moths. The aromatic oils evaporate quickly, and even when fresh, there’s no real scientific evidence that they scare off moths. One way to find out if you have moths is to hang moth traps in areas where they are likely to hang out. Traps are pheromone attractors with sticky pads of glue that capture moths that are intoxicated by the smell and venture in. If you get moths in your traps, you know it’s time to do a thorough assessment and cleaning. The best way to find out if you have an infestation is to carefully examine natural fiber textiles when you’re taking them out of storage. Take them outside into good light and look carefully for the holes and webbing patches. If you find damage, seal the textile in a plastic bag and keep it outside until you can have it cleaned. You can also vacuum rugs to remove any larvae or eggs—but remove and dispose of the bag before bringing it back into the house. Thoroughly clean or dispose of whatever the mothy items were stored in. If it’s a wooden chest, take it outside into the sunshine, vacuum and wash it. If it’s a basket or cloth bag, dispose of it. It’s not worth the risk of re-infesting your Nordic sweaters. Freezing temperatures kill moth larvae. If you have a cold garage and can leave mothy items there for a few days, it’s always a good idea to do so before having the garment or carpet cleaned. The best way to prevent moths from getting a hold on your closet is to properly clean and store textiles in tightly sealed containers. Routinely vacuum rugs, tapestry and upholstery. Feel free to be overly cautious, better safe than holey. It is much, much easier to prevent moths from getting into things than to get rid of them. If you’re an antique or vintage lover, don’t bring moths into your house with a beautiful antique rug or vintage swing coat. The cost of cleaning prior to bringing anything that’s been in someone else’s house into your house will be well worth it. And don’t store things in a fantastic antique trunk until it’s had a few days of sunlight and a thorough vacuuming or three. By the same token, if you are sorting through your no longer needed clothing and you discover moths, either dispose of the clothes or have them cleaned before you donate or sell them. You don’t want to inadvertently spread moths to a house that doesn’t have them. Clothing moths are not the worst thing that can happen to you, and if you find them in your things, rest assured, you are not alone. Dealing with them thoroughly takes time, but it’s well worth the effort—particularly if you are transitioning to a new home. Moths definitely do not have a place on the list of things to bring with you!